Runtime: 2 hr. 25 mins. 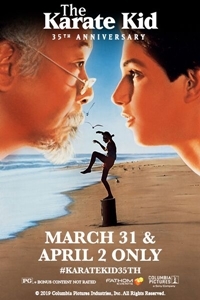 Practice your wax on wax off for a special 35th anniversary showing of The Karate Kid! Ralph Macchio stars as Daniel, a teenager who arrivrs in a new town where he must start from scratch and make new friends. He quickly becomes the target of a menacing gang of karate students. Eager to fight back he begs his handyman, Miyagi, a martial arts master, to teach him karate. Under Miyagi's wise tutelage, Daniel develops not only the physical skills but also the maturity, faith and self-confidence to compete despite tremendous odds. This event will also include a custom introduction from Ralph Macchio and William Zabka and a Cobra Kai Season 2 Sneak Peek.